Please comment or post on the attached VIs not on 2011 ones. 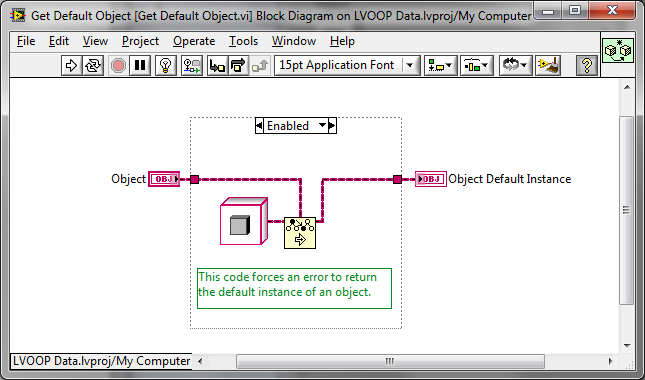 Please see my previous post where I introduced the object outputs. At least when calling these VI’s in a For Loop on an array of objects, the lack of an output seems to require a copy of the object, leading to poor performance for large objects. This adds (in my tests) more than 150 microseconds of execution time for objects containing a 1 million U8 byte array. This compares with times of between 1 and 10 microseconds for the various proposed VIs with object outputs (note, I don’t even need to connect the outputs). Admittedly, I don’t particularly like having outputs, especially on comparison VIs, but the performance difference is potentially large. Large enough for me to have to worry about it and have custom “high-performance" versions of the VI’s to use if it matters, or just use the raw code in each case. This would eliminate most of the advantages of putting these VIs in OpenG. You did a similar thing in replacing the “Get Default Object” subVI in the Name VI; I want to avoid that kind of thing as much as possible. Note, also, that having object outputs, though not consistent with other OpenG VIs, is consistent with how LVOOP methods are written, where even “Read” methods have an object output. So, I would strongly argue for these outputs, and encourage any lurkers to comment on this one way or the other. Sorry I missed that post above. As per my post I hadn't got to performance testing then, but I am doing some now as I have both VIs - the time difference is quite surprising - and I wonder if this would be optimized in the future? And what the answer to your question is regarding the effect of inlining. One thing I did notice is the coercion when there is no connecting output, which disappears when its thralled. ...is consistent with how LVOOP methods are written, where even “Read” methods have an object output. How does the new “inline” option play in to that? 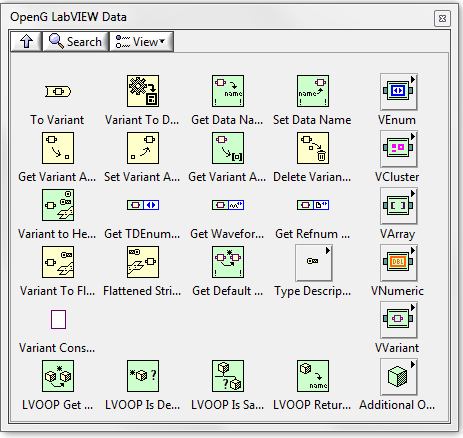 In has always seemed strange to me that OpenG VIs are mostly non-reentrant. 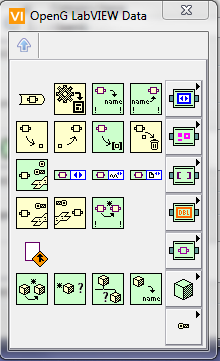 It makes them different from the LabVIEW primitives that they supplement/extend. But that might be a different conversation. Though I note that you did remove the “Get Default” subVI from “Return Class Name” to improve performance. In doing so you eliminated the self documenting advantage of the subVI; a new LabVIEW user will be mystified as to what “Preserve RunTime Class” is doing here. Would it not be better to “inline” that subVI and use it? Or just accept a performance hit (which I think is quite small)? At the very least we need a comment here. Side Note: I noticed that OpenG has an off-palette subVI for parsing a PString (“Get PString_ogtk”) that is used in the Variant VIs. Perhaps that should be used in “Return Class Name”, where we are walking along a set of PStrings? The only advantage is getting the short name slightly faster, but that is probably not a good enough reason for a separate VI. BTW, maybe we should call the short name form “Base Name” or “Class Base Name”. Everything else looks fine to me. 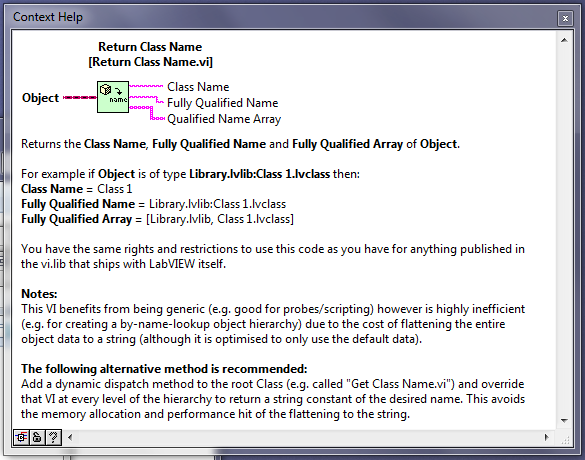 The only quibble is that the documentation for “Return Class Name” singles it out as being “highly inefficient” when it is considerably more efficient that many VIs that ship with LabVIEW, such as the VariantType Library or “Get LV Class Path”. But ignore the quibble. How does the new “inline” option play in to that? It doesn't, or rather, cannot yet as the OpenG source is currently in 2009. Whenever it moves up where inlining is supported, then we will need to review it for valid use cases. Given you started in 2011 any information we have we should use to document the VIs now tho. I actually went ahead and converted all my reuse VIs back to non-reentrant (except where specifically required). Noted, I can fix that by using documentation. I would prefer to group all the LVOOP functions together - so they are easy to find. Even though the implementation may be related, that could change in the future. It gets the Class Name from an Object so it should hang out with the other Object functions. Yep, that's the trade off but I prefer to lean over to maintainability here. 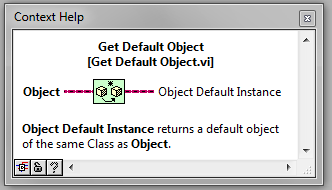 Isn't the VI up above one that, given an object, returns the default value of that object? 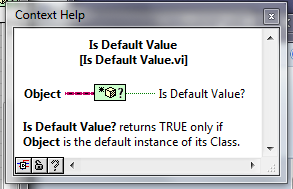 And Get LV Class Default Value.vi returns the default value if all you know is the class. What are you looking for? Man, that is a massive palette. Why does the it have its own version of the variant constant? If you eliminated that, you could condense it to a more reasonable 5x5. 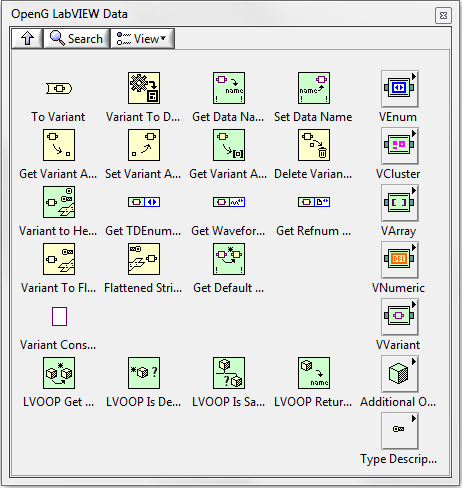 The native LabVIEW variant palette doesn't have a "Variant Constant". I personally find this one very useful. I don't consider it 'that' big however, am happy to take on board such feedback (which is why I post stuff) - so I will see what I can do. 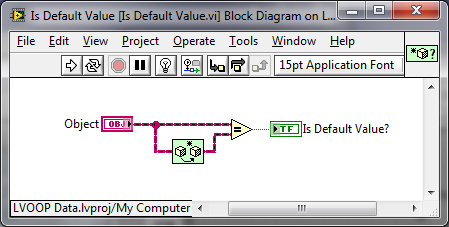 I may move the constant but I will not remove it as Fraswa says - it is not native to LabVIEW and is handy to have. Hold off on finalizing this until the end of the week, please. I'm asking compiler folks to investigate the performance gain of adding the output terminal to see if there's another way to get that gain OR if it could at least be made unnecessary in LV 2012. Since this affects the conpane of the VIs, and that would be hard to remove in the future, it would be better to publish without it. If you don't hear from me by the end of this week, ping me, please. It looks worse because of Icons and Text view - this is what it looks like as Icons only (in VIPM). I would like to be able to change this is VIPM - if anyone else does too then check out and vote for David's cool idea (and my comment!) on the VIPM Idea Exchange. Ah ha! If my verbiage didn't make it obvious, I thought it was also somewhere else. You can see how often I've needed one. It does look much better in Icon view (which is what I use anyway, now that I pay attention to what I'm saying). The reorganization does help, either way. That output terminal will not be needed as of LV 2012. There was a (bug / unimplemented optimization -- depends upon your view) that made LV add a copy at certain upcast coercion dots. This compiler (fix / upgrade) will have performance benefits for a wide range of LVOOP applications. The change was implemented months ago, so this API doesn't get credit for finding the issue, but the compiler team verified your VIs do benefit from the change. I would therefore recommend not putting it into the API as removing the terminal is a possible mutation issue, and not having the output terminal for a read-only operation is a much better API overall. Oh good! Having to put those terminals in was annoying. I second the suggestion to go without the terminals. Though we might want a temporary note in the VI descriptions and/or on the block diagrams explaining this issue. This same change will have effect of removing a copy on control refnums and .NET refnums also, although the effect will be much much smaller since the maximum amount of data copied in those cases is a single int32. My prefs are set to Category (standard) and all the other sub-pallettes do not have any text at the bottom. This started to happen a while (a year?) ago? The most immediate downside I see to this is that if you use Quick Drop or the search functionality, you won't be able to see whether the VI in question is OpenG or not. Whether or not this is catastrophic is up for debate. Thanks everyone for their input - especially James for his donation of VIs. This OpenG Review is now closed. Please start a new thread to discuss new changes to this VI. Please PM me if there are any issues with this thread.